Manufacturing these industry-leading boats at the Brunswick Corp. New York Mills (MN) operation still requires a great deal of manual labor, performed by experienced, dedicated artisans. The Brunswick Corp. New York Mills (MN) operation, home of Lund Boats and Crestline Boats, consumes 7 million lb. 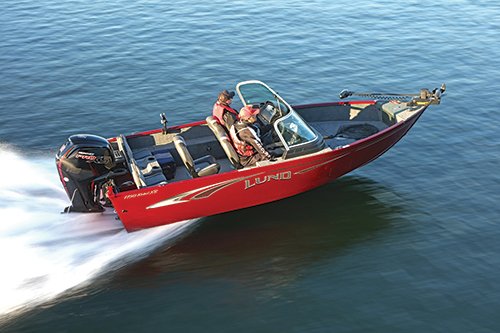 of aluminum per year, manufacturing watercraft from 12- to 24-ft. long. Tucked inside the 290,000-sq.-ft. manufacturing operation is a 30,000-sq.-ft. sheetmetal-fabrication shop where manufacturing engineer Nic Pederson supports the work of 32 associates. Their task: move aluminum coil stock (the plant takes in 8000-lb. coils from 5- to 6-ft. wide), mostly 0.063- and 0.080-in.-thick Type 5052-H34, through shearing, straightening, cutting, forming and assembly operations. Manufacturing these industry-leading boats, favored by the most serious of fisherman the world over who seek the “ultimate fishing experience,” still requires a great deal of manual labor performed by experienced, dedicated craftsmen. With so much manual labor required, Pederson and other shop-floor leaders in the plant pay close attention to ergonomics and employee health and safety. To help evaluate the ergonomic risk of various tasks performed, plant management employs tools from workplace-improvement specialists Humantech, Ann Arbor, MI. Humantech provides survey and assessment methodologies designed to help managers identify and evaluate specific ergonomic risks associated with tasks throughout the shop, looking at factors such as the extent of back movement, wrist strain and elbow extension. Based on factors such as hand position, the amount of repetitive motion involved, vibration and force required to do the work, the ergonomic scorecard rated that job the third poorest task in the entire plant. While the company had tried to find a better method, it recently worked with its press-brake supplier, LVD, and tooling company Wilson Tool, to come up with an automated flanging operation. The solution to the New York Mills flanging challenge: implementation of a new 20-metric-ton Strippit PX punch press from LVD, boasting 3 in. of punch-die clearance for optimum forming capabilities, equipped with a custom Wilson Tool Opti-Bend tool designed to flange curved profiles. A rotating cam in the die bends the material during the punching stroke, simulating the cycling of a press brake without marking the sheet. Wilson Tool modified the rocker to, in concert with the way in which the sheet indexes in the press, create the curved flange. Each boat manufactured at the Brunswick factory includes five or six of these supports, fabricated from 0.063- and 0.080-in.-thick Type 5052-H34 aluminum. Flanging the parts manually using a 1940s-vintage machine created inconsistent results (bottom part) and was not a very ergonomically sound job. Forming the parts on a punch press with a custom upforming tool automated the work and led to much more consistent part quality (top). Of note: The H34 temper on the aluminum stock means that the material is strain hardened, and then stabilized, to a strength that is roughly halfway between annealed (O) and full-hard (H38). That gives it good workability, in addition to good corrosion resistance, high fatigue strength and good weldability. 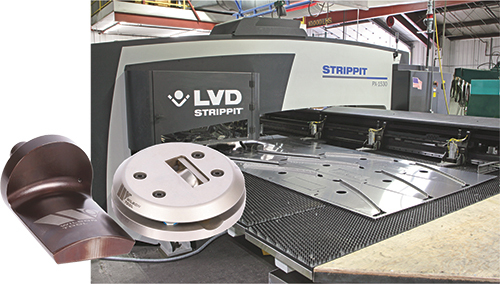 LVD markets the Strippit PX press, installed at the New York Mills plant in January 2017, for punching, bending and tapping. It boasts, in addition to the added bending capacity, a 20-station tool carousel; maximum hit rate is 505 hits/min. at a 1-in. pitch. Nominal workpiece capacity on the machine is 60 by 120 in. However, to accommodate larger sheet sizes and to avoid drooping of the relatively thin work, LVD worked with the facility to equip the machine with an additional 40 in. of table length. Pederson says that bend-angle tolerances now are ±1.5 deg., improved considerably from as much as a 3-deg. variance before. The shop uses two sets of the custom Opti-Bend tooling for flanging—one to form a 77-deg. angle, the other to set a 90-deg. flange. To automate the forming operation performed on the bulkheads, the plant invested in a new Strippit PX punching machine from LVD. 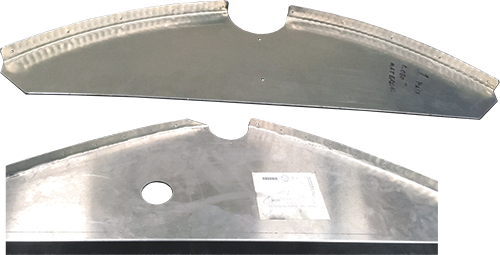 The blanks (shown here still in the sheetmetal nest) are flanged in the press using a custom Wilson Tool Opti-Bend upforming tool (inset). In one week’s time, the Strippit PX press turns out 2000 of the structural supports, in a variety of sizes and shapes to fit the contour of the boats—about 600 different part numbers in all. When we spoke with Pederson, the press, in addition to flanging the parts, also was being used to nibble the part peripheries. The master plan is to use a new 8000-W fiber-laser cutting machine, an LVD model expected to hit the shop floor early in 2018, to cut the blanks.